In the early 1990s, when I was a fresh-faced marketing executive at a consumer products company, I developed a framework for my team to help them think through strategy. There are, I posited, precisely ten ways to increase the profit of your company. No more. No fewer. Ten. The Ten Roads to Profit Growth™. 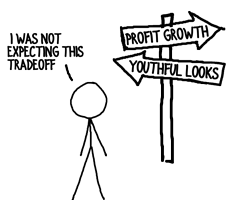 That framework proved so useful that I incorporated it into my practice when I founded Ascendant Consulting. We have uncovered hundreds of millions of dollars of growth opportunities for businesses ranging from $2 million to $20 billion using the Ten Roads to Profit Growth. Last summer I was visiting a high-growth software company in Boston, the CEO of which actually served on my marketing team all those years ago, and he told me he still referenced the framework to direct his company. He also said I’m still fresh-faced. Go figure. Could a framework that was developed for consumer products apply at consulting companies? Could it help you grow your firm this year? You bet. [at the bottom of the post], two pages of paper, a thinking partner and a single day of effort following the steps below will serve you well. How could you create an improvement on this road? Example: How could I trade my clients to higher-ticket offerings [Road #7]? By always presenting my most popular, current offering as one piece of a larger approach and always pursuing “Stage 2” of my approach before I finish the initial engagement. How much could you move the needle with this road? Example: I estimate I could convert 10% of my clients from my most popular offering to a larger-ticket project. This would represent a $300,000 revenue increase. Which roads deliver the greatest, expected impact on the business? Are there any high-risk/high-reward roads where you’d like to place a bet? Are there any low-return roads you would consider to hedge your risks? Are there any low-return roads you should pursue over the next six months in order to achieve your 3-5 year objectives? Focus. Arrange in advance for an outside partner to help you focus. Trust me on this. After thinking through all ten roads, the opportunities you’ll have uncovered are like chocolate; they’re strategy crack and highly addictive. You’ll be overwhelmingly tempted to gobble them all up, even though you know intellectually that pursuing too many strategies and initiatives will bury you. That’s where your pre-arranged partner will jump in, strap you down and insist you choose one or two roads. Three at most. Pinpoint Your Activities. Translate the strategic roads into specific initiatives you’ll pursue over the next six months. What, precisely, will you do to bring your focus to life? What resources do you need? What help will tip the scales to success? The Ten Roads to Profit Growth are in the form of an infographic, which you can download using the button below. 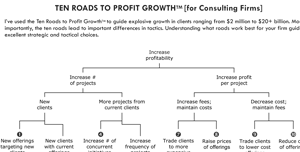 Since this was originally designed for corporations, I’ve included one-line summaries of how you could use each road to accelerate your consulting firm’s growth. Let me know which roads you’ll be pursuing by posting in the comments section on this page. Thanks, Mike. You probably use a number of approaches with your clients that could be turned around and applied to consulting practices. Consulting firms (especially large ones) have a reputation for struggling with innovation. Perhaps you can give them some tips! The phrase “less fun than pulling splinters from your aunt’s toenails” was the most colorful phrase I have seed online in years! A little bit of color spices up the typical, dry business writing that lulls us all to sleep. Thanks for noticing and commenting, Martha! Should be up and working now. Apologies for that resource being unavailable while we switched servers.